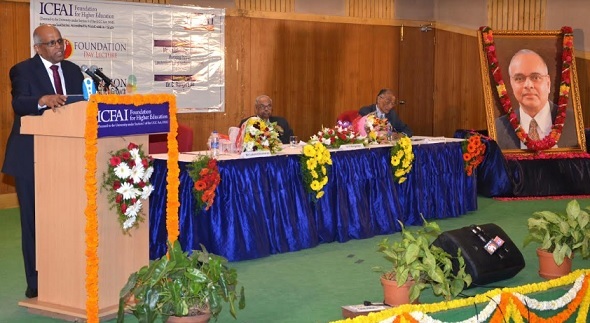 ICFAI Foundation for Higher Education (IFHE) organised 9th Foundation day at IFHE campus in Hyderabad on February 08, 2019. Mr. Lakshmikumaran, a leading litigating lawyer and Managing Partner of M/s. Lakshmikumaran & Sridharan Attorneys, New Delhi said in his lecture, “Education has a larger context and is not merely for teaching and giving knowledge. It imparts several tools that can be used in the latter part of life.” Dwelling on the importance of education as an engine of growth he added, “Education is a tool that can be used to develop something phenomenal.” He said that there is a direct Co-relation between GDP and education.